Have you been told that you don’t have enough bone to support Dental Implants? The revolutionary Zygomatic implants might be a solution for you. Zygomatic implants are placed in the upper jaw when there is insufficient bone to support ordinary implants. 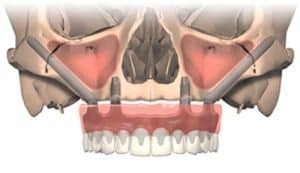 They provide great support for bridgework where there has been a substantial amount of bone loss from the upper jaw, and ordinary implants could not be used on their own to support a bridge. Bone atrophy is a natural phenomenon that occurs after the extraction of teeth, and which is exacerbated over time due to wearing a denture. Patients with advanced atrophy in the jaw may not have the minimum volume or quality bone required to have dental implants. The situation might be the same even when there are teeth still present, and these are affected by severe infections or gum disease that cause the jawbone to weakened. These patients have traditionally been deemed unfit for conventional dental implants. Zygomatic implants are quite longer than ordinary implants, as they need to Anchor in the cheekbone also called: Zygomatic bone. This procedure serves as an alternative to complex bone grafting procedures, enabling patients to receive new teeth in a day. Prior to doing the procedure, an X-Ray will be performed to assess the amount of bone available in the upper jaw and allow Dr. Daniel to plan the placement of these implants. When Dr. Daniel uses Zygomatic Implants, he uses the Nobel Clinician program as a tool for guidance. This program allows him to perform a blueprint of the surgery prior to the actual surgery-taking place. The program also helps Dr. Daniel to find optimal placement for the implants, maximizing function and integration for patients. It also acts as an information tool to show patients how the process will take place. Dr. Daniel has been providing this treatment since 2008 and remains one of the few clinician offering this treatment option in Atlantic Canada. Immediate loading and teeth in a day. For more info on Zygoma Implants, please call our office today!